Staff at the Total E&P Limited gas terminal at St Fergus have shared out £10,000 to five local charities. Personnel at Total achieved One Year Lost Time Injury Free in May. To mark this achievement, the site was awarded £10,000 and was requested to make a donation to charities that help support the local community. Site personnel were invited to submit recommendations with the final selection each receiving a cheque for £2,000. Representatives from Alzheimer Scotland, Clan Cancer Support, Rosehearty Community Boat Club, MS Society Scotland and Children 1st were presented with their cheques by Stephanie Thom, terminal manager on Thursday, October 1. Stephanie said: “Our workforce is committed to helping local organisations and many individuals on site regularly take part in a range of personal fundraising activities for good causes. Janice Caine, North Aberdeenshire Services manager of Alzheimer Scotland said: “I’d like to thank St Fergus gas terminal for their generous donation of £2,000 to Alzheimer Scotland, North Aberdeenshire Services. 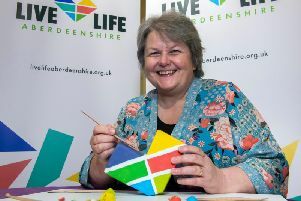 She added: “We are looking into establishing a dementia resource centre in the area which will provide resources and services to people with dementia and their families so they are not facing dementia alone. MS Society Scotland will use their £2,000 donation to help keep their Grampian Multiple Sclerosis Therapy Centre in Dyce up and running. The aim of the centre is to show people with Multiple Sclerosis how to help keep themselves as fit as possible through the use of suitable exercise, hyperbaric oxygen and alternative therapies such as reflexology.